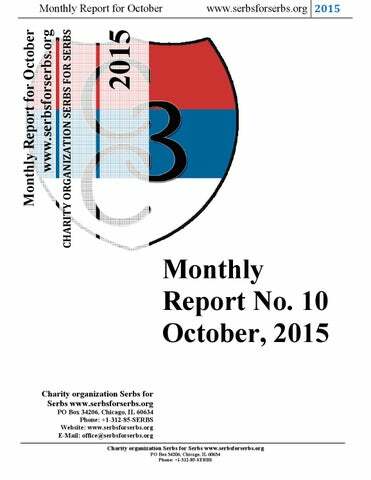 Monthly Report for October Dear friends and donors, Charity organization Serbs for Serbs registered in the state of Illinois in United States in Jun 2010 by the group of the Serbian youth. 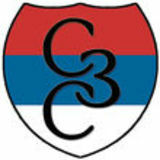 Charity organization Serbs for Serbs is a 501(c)(3) notfor-profit charitable organization. Donation is tax-deductible to the extent followed by the law. On 30th September, 2011 we finally got the letter from department of the treasury (IRS) with tax exempt 501(c)3 approval. All donations to our organization donated from June 16, 2010 are tax deductible under section 170 of the Code. We are also qualified to receive tax deductible bequests, devises, transfers of gifts under section 2055, 2106 or 2522 of the Code. Representatives of the Charity organization SERBS FOR SERBS from Montenegro visited on October 2 the sixmember family Vlahovic who lives in the Podgorica suburb Konik. Father Radojica (48) and mother Vojka (45) have four children: Vesna (12), Jovana (11), Jelena (9) and Vasilije (7). They live in a tin-cardboard home as subtenants in two small rooms almost without furniture, for which they pay 50 EUR per month. The parents have severe health issues, and the children are receiving food from the Public kitchen of the Metropolitanate of Montenegro and the Littoral. The parents Radojica and Vojka are unable to work, and severely ill. Radojica was employed as a guardian until the City Transportation Company was closed down. As an asthmatic he is unable to do heavy physical labor. The Vlahovics live on social benefit in the amount of 175 EUR and the nice people’s gifts. The children are well-bred, and they made strong impression upon the representatives of our organization. The city authorities of Podgorica didn’t help them in resolving their housing issue, which is currently a burning question of this family. - If it wasn’t for the Public kitchen at the Episcopal Church of Christ’s Resurrection in Podgorica, we wouldn’t know what to do. Monthly Report for October Perhaps we would starve to death. The Church brings us five meals for our family every day. We thank them from the heart, because without them, we wouldn’t know what to do – says Radojica Vlahovic while telling us his sad story. www.serbsforserbs.org 2015 The regular cooked meal and bread gives at least current security. Besides the food, the Church is helping to the Vlahovic family, as well as other disadvantaged families, by providing onetime help. The help is being provided occasionally, and it doesn’t include food alone. – The Church to which we are immensely thankful is not only providing us food, but it also brings us occasionally clothing, footwear, blankets and certain commodities for the house if possible. It means a lot to us. We know we are not alone. The municipality provided us with textbooks for the children. Some of them are new, some used, but the children are using them anyway, and we are grateful for that – said Radojica Vlahovic. His origins are from the Rovac tribe, and obviously life hasn’t given him the opportunity to make shift in life. Since the foundation of the Public kitchen at the Episcopal Church in Podgorica, they are regular beneficiaries, and are more than satisfied with the meals. Father Miroslav is connecting parts of the trimmer Family Nikocev expressed great thank to the donors of the Charity organization Serbs for Serbs. Charity organization SERBS FOR SERBS calls upon all its friends and donors to get involved in the action of collecting the means for helping this and other socially disadvantaged multiple children Serbian families. In the previous period Charity organization SERBS FOR SERBS has successfully helped the sevenmember family Savic from the Snjegotin village, Celinac municipality in the Republic of Srpska. The oldest member of the family is grandma Slavojka Savic, and then her son Vukosav who has four children with his wife Snjezana: Nikola (16), Vladan (14), Marko (12) and Mladen (10). We provided family Savic with pluming material, a package of food and hygiene, as well as accommodation with meals in the school dormitory for the oldest son in total amount of 1.849 KM. www.serbsforserbs.org 2015 Family Savic lives in an old family house which is in a bad state, and has only the ground floor with two rooms, of which one is a bedroom. Apart from many financial problems, family Savic doesn’t have running water in the house. They bring the water from a well which is approximately 600 m away from the house. The parents are not permanently employed. Vukosav is working in the forest for a wage and mother Snjezena is taking care of the children together with grandma Slavojka who is receiving a pension in the amount of 160 KM, which is the only regular monthly income. The grandma’s greatest concern is her oldest grandson who is living in a school dormitory, and as she points out, she doesn’t know how long they can live in such a manner. The pension is too small in order to provide the basic things to the children, so they asked for help in food, accommodation of the oldest son in the school dormitory and resolving the problems with the water. Mladen Savic is helping while entering the groceries A few days after our first visit we sent a package of food, and afterwards we paid the accommodation and meals for the entire school year to young Nikola. After the two actions we commenced the project of bringing the water from the nearby well from which they were carrying water before. We bought pipes at the beginning, while in the meantime the Savics dug the canal for the pipes themselves. Water pipes arrived at Savics The canal was dug from the well to the first pool which is 720 m long, while the altitude difference is 90 m. The plan is to bring the water from the pool to the house by free fall in the length of 500 m. Setting of pipes and digging of the first pool is in progress, and that will unfortunately mark the end of the project in this year due to the lack of funds. We hope that we will continue the project as soon as possible, and buy the pump, cable and the remaining material in order to bring the water and finish the entire project of help to the seven-member family Savic. The sport-charity tournament in fast shooting of threepointers “Trojka iz bloka” was held in Novi Sad on May 23, when thanks to the proud sponsors and 157 applied contestants we collected 232.710 dinars and 100 EUR. Charity organization Serbs for Serbs thanks everyone for supporting the tournament and is pleased to announce that the project of building and equipping the bathroom to family Rodic from Stari Ledinci is successfully finished! Members of the family are parents Dejan and Aleksandra with their son Stefan (12) and daughters Lena (8) and Teodora (6). The total value of the material and works was 323.988 dinars. Current layout of the family Rodic bathroom Novi Sad showed how it takes care of its residents in the most beautiful manner! We wrote of the five-member family Rodic and the situation in which they live prior to the tournament in Novi Sad, during the tournament “Trojka iz bloka”, and Radio Television Vojvodina made reportage. Today, several months later, we will write only one thing – we expanded their house by building the bathroom, but in that manner we spread their views, pointed to new chances and opportunities and to a number of people throughout the world who are there for them when it is the hardest. When it is the hardest, we should work the most – the Rodics have used some of the remaining material after building the house and the bathroom, collected additional means and renovated the kitchen by dividing it into half. We found two rooms when we met this hardworking and honest family – now there are four! www.serbsforserbs.org 2015 We all gathered and lent a hand to family Rodic and led them to a better tomorrow. Everyone contributed on his way and every help is big, which is best shown in the big result! We particularly thank to company Milinkovic which was transporting the necessary material free of charge and thus saved significant amount of money in this project. Happy, satisfied and grateful family Rodic When everything was over, we visited the Rodics in their home, from where they send cordial greetings to everyone. New future in Novi Sad! In the Rodic house in Stari Ledinci everything is now new! With the help of donors and sponsors, with much work, bricks and blocks, something big, indescribably and invisible, but yet – bright and full of hope – the future! This summer, representatives of the Charity organization Serbs for Serbs visited the nine-member Nikolic family from Kladovo, for which the funds raised through the sports-charity “Trojka iz Bloka” project were intended. The 3-point shooting tournament held in the town on the Danube on July 23 was very successful. There were about 1,500 people present, with about 150 participants, and over 200,000 Dinars were raised, so it can honestly be said that it was one of the most successful tournaments this year! Our proud sponsors did not stop at contributing funds to the mission of the “Trojka iz Bloka” – aware of the hard living conditions which the Nikolic family lives in, they decided to help in every way they could. And the Nikolic family needs all the help they can get! The parents, Zoran and Zivadinka, raise seven daughters: Zorana (16), Jelena (12), Marina (11), Tanja (8), Rada (8), Milica (3), and Eugenija, who is seven months old. Let us try to make their modest dreams come true and make the seven princesses get the life they deserve! On Tuesday, October 12, representatives of the Charity organization SERBS FOR SERBS and our big friends from the NGO â&#x20AC;&#x153;Majka devet Jugovicaâ&#x20AC;? from Gracanica delivered a valuable donation to a newly opened hospital with maternity ward in the village of Pasjane, near Gnjilane in Kosmet. The donated aid, worth 54,000 Dinars, consists of a fridge and a freezer for keeping food in the hospital kitchen, which is to start working soon. The hospital with the maternity ward in Pasjane was opened at the beginning of 2015. A month ago they started to work using the latest technology and equipment, provided by the Ministry of Health of the Republic of Serbia and the Serbian government's Office for Kosovo-Metohija. Initially, the Soup kitchens in Kosmet will help by providing food for the hospital kitchen, and the aid of the organization SERBS FOR SERBS has definitely contributed to providing all the necessary conditions to make the hospital with the maternity ward in Pasjane a place where Serbian children will be born in Kosmet. Charity organization Serbs for Serbs helped the sixmember family Velic from Gracanica on Kosovo and Metohija in early October. Member of the family are father Boban and mother Darinka with their four sons: Lazar (12), Nikola (10), Dusan (6) and Luka (4). We have already helped the Velic family during the summer by providing a washing machine and an iron. This time, we provided them two bunk beds with mattresses, kitchen furniture with sink and worktop, a dining table and chairs. Total value of help is 108.174 dinars. We express our immense gratitude to our dear friends from the EHO â&#x20AC;&#x153;Majka devet Jugovicaâ&#x20AC;? for their help during the delivery of household appliances. Charity organization SERBS FOR SERBS calls upon all the friends and donors of the organization to get involved in the action of collecting money for helping this and other socially disadvantaged multiple children Serbian families. Thanks to the donation of the Serbian Cultural Center “Nikola Tesla” from the German city of Hagen, Charity organization SERBS FOR SERBS conducted the purposeful action of help to the five-member family Popovic from Obrenovac who was hit by the floods in 2014 when their family home was completely flooded. The Popovic family received construction material and artisan work for the reconstruction of the roof in the total value of 288.217 dinars which would enable them to continue reconstructing the inner rooms of the house in order to move into the house till the end of the year. The householder Mihajlo also took out a loan to enable his family to move into their new house before the upcoming winter. The chapter of the Charity organization Serbs for Serbs from Montenegro, together with the brotherhood of the Ostrog Monastery, helped the eleven-member Scepanovic family from Ozrinic, near Niksic. The parents, Mihajlo and Anastasija have been blessed with nine children: Vasilija (15), Lazar (11), Luka (9), Teodor (8), Stefanija (7), Magdalina (6), Nikola (5), Ana (3), and Aleksandra (2). Our first visit to the family was a year ago when we agreed on helping them by providing construction material for finishing the work on the family house. The total cost of construction work and materials was â&#x201A;Ź 6,304. Representatives of the Charity organization SERBS FOR SERBS visited another socially disadvantaged family in the Prijedor region. It was the Davidovic family from the village of Marini, located between Prijedor and Novi Grad, or to be more precise, 30 kilometers away from Prijedor. We had learned about this family from the brotherhood of the Klisina Monastery, and they soon introduced us with the family. The Davidovic family consists of the parents, Dalibor (36) and Vesna (27), and their four children: Nikolina (8), Dejan (6), Natasa (5), and Pavle (2). We wanted to get acquainted with the living conditions of the family, so we visited them at their modest home. The family lives in a very small and shabby house, but with basic conditions. Considering the fact that the biggest problems we had previously encountered visiting the families were unsanitary bathrooms and dampness, this family, luckily, does not have these problems. www.serbsforserbs.org 2015 The Davidovic family lives on child benefit and occasional wages that the father of the family, Dalibor, earns. They own a cow and about fifty hens, and this is how they provide food for themselves. The family also owns a small patch of land, which they cultivate and they also cultivate the land around their house, with the permission of the owners who live far away and are not interested in cultivating it. The biggest problem for the family is the location of the house, about a kilometer away from the main road, which is very hard to reach via the rugged road leading through the forest. Since the main road is also mostly a gravel road, i.e. there are more than 15 kilometers of the gravel road to Prijedor, they live in hard conditions. The winter is approaching along with bad weather, and the children have to go to school using the forest road. Taking everything into consideration, and also talking to the father of the family, Dalibor, the plan is to provide the Davidovic family with a used tractor. The experience so far has shown that purchasing a tractor for families is one of the best investments. So, not only will the family be able to travel from home in case of bad weather conditions and not take the risk of being cut off from the world, but Dalibor will also be able to cultivate more land than he is doing at the moment and use the tractor to earn additional income for his family. The amount of money needed for this action is 8,000 BAM or a little over 4,000 Euros, so we would like to take this opportunity to invite all friends and donors of our organization to join the fundraising action in order to enable another family to stand on their own feet and pave their thorny road for a more beautiful and less gloomy future. CHILDREN ARE OUR FUTURE! Although the season of the “Trojka iz Bloka” tournaments is officially over, members of the Charity organization SERBS FOR SERBS continue their activities related to this sports-charity project. Hence, on October 23, organization representatives, Mladen Matijasevic and Milos Simovic, visited the ninemember Pesic family from the village of Samajla near Kraljevo. This family was chosen for bathroom construction and fit-out as part of this year’s “Trojka iz Bloka” held on April 13 in the city on the Ibar. The project was successfully finished and its total value was 225,821 Dinars. It is always nice to go back to Kraljevo, where we started the forth and most successful season of our charity outdoor 3-point shooting tournaments this year. However, this visit was especially important and dear to us because of the fact that nine Pesic family members – the parents, Tomo and Gordana, and their seven underage children: Ivana (12), Igor (11), Ivan (10), Ivona (8), Irena (5), Isidora (4), and Lena (2), will no longer have numerous problems caused by not having a bathroom. www.serbsforserbs.org 2015 The Kraljevo â&#x20AC;&#x153;Trojkaâ&#x20AC;?, held on April 13, raised 91,160 Dinars, and the Charity organization SERBS FOR SERBS provided the rest of the money in order to successfully finish another project of helping socially disadvantaged multiple children families. The total sum needed for the project was 223,476 Dinars. Monthly Report for October We opened the Kraljevo Tournament, held on Easter Monday, with the most joyful Christian greeting “Rejoice – Christ is Risen” and seven months later we acclaim happily and gratefully “Indeed – He is Risen”, because thanks to people of good will who responded and participated in the tournament and also to the sponsor of the first “Trojka iz Bloka” in Kraljevo – “Gala Market” company, indeed a hope in a better life of the Pesic family has risen. www.serbsforserbs.org 2015 Let us join forces and help even more socially disadvantaged multiple children families in the area of Kraljevo. Serbs for Serbs with the Pesic family in front of their house There is no doubt that we will shoot 3-Pointers for disadvantaged families in Kraljevo again next year and on Easter Monday, too. Hence, we invite people, public and private companies, sports clubs, local community representatives and print and electronic media, to respond in even larger number, and thus contribute to the tournament in the way they can – through participation, donations, sponsorship, reports and news. The Charity organization Serbs for Serbs started the work on replacing the roof construction of “Nasa Radost” kindergarten in Orahovac in Kosmet. Renovating the deteriorated roof construction is of great importance for our youngest ones, because this is the only kindergarten in this part of Metohija. There are about 50 children from Orahovac and Velika Hoca attending the kindergarten. The total amount of donation, covering the work and materials, is 415,000 Dinars. Members of the Charity organization Serbs for Serbs of the Republic of Srpska chapter visited the sixmember Mandic-Cosovic family from Pale. There are four children in the family: Aleksandar (17), Aleksandra (16), Jelena (15), and Andjela (5). Life is not a fairy tale and this familyâ&#x20AC;&#x2122;s story shows it. The mother, Snjezana, had previously been married to Mandic, the father of Aleksandar, Aleksandra, and Jelena, who had molested and humiliated her, so she worked up the courage and ran away from him, taking the children with her. She moved into her fatherâ&#x20AC;&#x2122;s house, who had adapted the attic for her and her children to live. Several years later, Snjezana got married to Radinko Cosovic, and they have a daughter Andjela. Radinko accepted her children as his own. www.serbsforserbs.org 2015 The fact that they also cultivate the land below the house and grow vegetables in the greenhouse they got from another charity organization is the proof enough of their dedication and hard work. Despite all this, the family cannot provide additional funds to invest in the house to improve their living space. They have somehow managed to build a bathroom in the lower part of the house, but it is totally impractical to use, because it is entered through the opening in bathroom ceiling. Therefore, the family was included in the “Trojka iz Bloka” project, which raised the money to build them a new bathroom. As the weather unexpectedly got worse and it started to be cold early, we cannot start work this year. Since we have to wait for the warmer weather anyway, we have decided to expand the action over the winter and try to raise additional funds with the help of our donors. We would use the funds to build the room for the children as well and thus definitely improve the living space for this family. The existing bathroom is impossible to renovate, because it is impossible to make the stairs which would lead to it, and it cannot be torn down to build the new one in its place. Realizing the “Trojka iz Bloka” project in Pale, we raised enough money to build the bathroom and expand the slab, which will provide enough space to build the children’s room. Since most Pale residents know the family to be hard working, beside the financial contributions made at the sports event, some private companies joined in afterwards, donating blocks and construction material. Together, we will try to provide all the necessary materials during the winter, so the whole aid action for the Mandic-Cosovic family will be carried out in the spring, as soon as the weather gets better. We hope that, with the help of good people, we will manage to make the dream of these hard working children come true, the children who are our future. On Saturday, October 17 in the Sport Center Olimp in the Zvezdara city municipality in Belgrade the last “Trojka iz bloka” in the best season so far was held! The hall of one of the most famous sport centers in the country was too small to receive people of all ages who came to support and help their disadvantaged fellow citizens in the best possible manner! Charity organization Serbs for Serbs and the School Basketball Club Zvezdara thank everyone who came to our tournament, especially our proud sponsors and contestants, all 112 of them! Through sport and fun we made another big step in the mission of the sport-charity project: we collected 61.130 dinars on Olimp! Another joint victory is behind us, the season which showed us how much we can and which set high standards we would try to reach and overtake the next year with all our forces! We learned so much this year, but the most important is – together we are stronger! The unity on Olimp was once again showed by our great friends, the legend of the world handball Nedjo Jovanovic and our famous writer Vanja Bulic, and the real surprise for the young hopes of the Serbian basketball were the first team players of BC Red Star Luka Mitrovic and Branko Lazic, basketball Marko Keselj, PR of BC Red Star Igor Vujicin and the assistant coach of the basketball representation of Serbia Jovica Antonic. Great heart: Marko Keselj Branko Lazic, Jovica Antonic, Dragana Kontic, Marko Keselj and Luka Mitrovic For the first time the competition was organized in two categories: younger than 14 and older than 14 – the struggle for two trophies and six medals will be remembered after the lovely atmosphere and very serious approach of the SBC Zvezdara, and all remaining devotees of basketball who support and visit the tournament “Trojka iz bloka”. The tournament commenced sometime after 13h by playing the anthem of the Republic of Serbia God of Justice, and then Milos Simovic, PR of the Charity organization Serbs for Serbs addressed the gathered and emphasized that this was the most successful season of “Trojka iz bloka” until now in 25 locations in 15 towns throughout Serbia and the diaspora, in which we gathered approximately 3,5 million dinars with the help of over 100 sponsors and over 2,500 shooters. Simovic thanked all famous sportsmen who came to Olimp by pointing out it was nice to see that they are, apart from being great and good sportsmen, are at the same time great and good people. Dragana Kontic, principal of SBC Zvezdara and president of the Assembly of the Basketball Association of Belgrade, also addressed the gathered and emphasized that the mission of sport is primarily to promote and develop humanity and the feeling for thy neighbor with the youngsters, and afterwards the competition spirit, and she called upon other basketball clubs and people from the world of basketball to support “Trojka iz bloka” which is promoting this beautiful sport in the best possible manner. Then our famous basketball players had the honor to officially open the competition part of the tournament by shooting three-pointers. Let’s dance… Triki Let’s dance… Dancing studio Evolution While the competitors took turns in two baskets, the guests were entertained by our friends musicians, rappers and magicians with the ball. Legend of the Serbian rap scene Skabo, young rap hope Uncle Jo, official DJ of “Trojka iz bloka” Sale L who was playing the music together with the great name of the music scene of Belgrade DJ Paja Koba33, joined us. Beauties from the dancing studio Evolution were dancing for us, and the best European basketball freestyler Nemanja Blazic Triki left everyone without breath! Each tournament in the best season had something of the magic of “Trojka iz bloka”, and the last one had it all! Joy and excitement due to the competition felt by the cadets of SBC Zvezdara reached everyone, a true spirit of sport, humanity and fun was tangible in the hall! Our proud sponsors on the last tournament were: Veluks – 7,000 dinars, Stimroler Ltd (Boutique of BC Partizan) – 7,000 dinars, and Studio LHS – 7,000 dinars. The gratitude for the really emotional and successful tournament goes also to: SBC Zvezdara, all coaches and the principal Dragana Kontic, SC Olimp, Zvezdara municipality, Sport Association of Zvezdara municipality, elementary school “Marija Bursac” for technical support, sponsors, donors, companies NIS, Merkur, Ceramics Jovanovic and media friends of the tournament Studio B, Pink Television, TV Nasa, Happy Television, Grand Television, RTS, radio Slovo ljubve, Bum bum radio… Great team of great people and companied which we are proud of and due to which we last throughout all these years! Our family is getting bigger and happier; there are no words that can describe the pleasure in the community of good people who work in achieving great goals! In the competition of 44 younger competitors the most successful were the winner Marko Mladenovic, the runner-up Nemanja Glisic and the third placed Nikola Nastic, and in the competition of 68 older competitors the most successful were the winner Nikola Pejovic (21 three-pointers), the runner-up Aleksandar Zecevic (19 three-pointers) and the third placed Jovan Josipovic (17 three-pointers). We congratulate the best shooters, and the true winner is the spirit of community and benefaction that revived once again in its full strength on our tournament! On Saturday, October 17, KUD “Jugos” from Munich organized the autumnal entertainment with multifarious program. The folklore societies of various generations performed, there was an offering of different dishes and drink, and the guests were also entertained by the singer Jelena Brocic. The guests of the evening were KUD “Drina” from Augsburg and KUD “Jelek” from Munich. Members of the Charity organization Serbs for Serbs from Germany were at the spot with their stand where they were selling T-shirts and distributing informative material and annual reports. We collected a total of 500 EUR on the entertainment, on which our organization warmly thank all the donors. SKSD Nemanjici from the German city of Konstanz organized their second annual foundation celebration. Folklore groups of different ages belonging to this society performed their dances, and the youngest dancer was only three years old. There was also a performance of the church ensemble “Svilen Konac” from Friedrichshafen. This time as well, there was an infostand of the Charity organization SERBS FOR SERBS, where we handed out annual reports and sold T-shirts from the SZS boutique. We got a special surprise from Ms Snezana Pilovic, who made a cake with the logo of our organization especially for this celebration. We raised 400€, and we wish to extend our deepest gratitude to the donors. We also wish to cordially thank the “Nemanjici” for their warm and homely welcome and treat. FAMOUS SEND SMS MESSAGE ON 7763 At the beginning of March, 2015, the Charity organization SRBS FOR SERBS established a cooperation with Telekom, Telenor and Vip mobile service providers to start a charity SMS number 7763 in Serbia. It is sufficient to send an empty SMS or an SMS with any text you want. Your message will be charged at 100 RSD (without the charge of your service provider). By sending a donation to this number, you directly help children from Serbian multiple children families throughout the Balkans. 1.176 MESSAGES TO 7763 IN SEPTEMBER At the beginning of March, 2015, the Charity organization SERBS FOR SERBS, in cooperation with mobile service providers Telekom, Telenor and Vip, started a national campaign for helping socially disadvantaged families throughout Serbia. During September 1,176 messages were sent to the charity SMS number 7763. The charity campaign SMS to 7763 continues. It is sufficient to send an empty SMS or an SMS with any text you want. Your message will be charged at 100 RSD (without the charge of your service provider). We extend our deep gratitude to all donors and friends of the organization who have taken part in the charity campaign of the organization SERBS FOR SERBS. Serbs for Serbs Report October 2015.